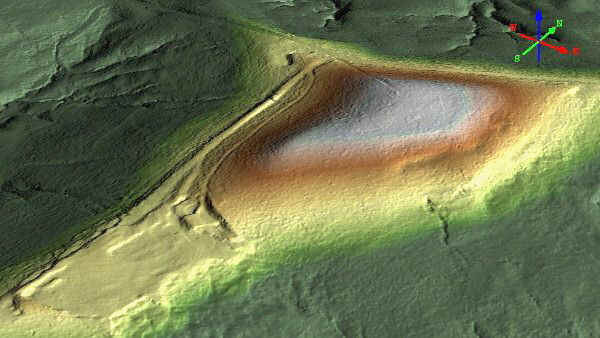 Aerial LiDAR view of site with (partially destroyed) prehistoric linear earthwork, showing artificial terracing on opposite (east) side of hill. This material is presented for consideration by anyone with an interest in the early habitation of North America, describing artifacts first recognized and recorded in 1987 at an unglaciated hilltop site in southeastern Ohio. These are compared with similar artifacts from locations in other parts of the world. 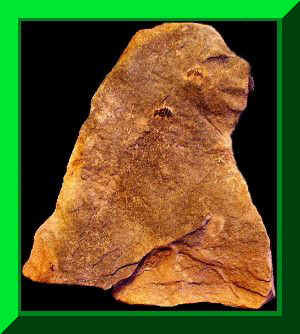 It is proposed that humans - and maybe even protohumans - routinely modified lithic material to incorporate simple but recognizable zoomorphic and anthropomorphic imagery, often along with at least potential utility as tools. This practice could have originated in Africa, migrating through millennia of ethnic and cultural diversification northward and eastward into the Americas, surviving here into at least the Early Woodland Period (ca. 2000 years BP). Initially recognized only as crude stone tools, but subsequently as much more, the artifacts have appeared in large quantity at depths of from near the surface to well below, and the surface of this large site has only been scratched. At this time, several doctorate-level professionals - geologists, petrologists, anthropologists, a forensic biologist, and a few archaeologists - have personally identified human agency in both lithic and organic material. The Ohio Historic Preservation Office has included the site (#33GU218) in the Ohio Archaeological Inventory, recognizing evidence of prehistoric habitation. Ohio's state archaeologists have, however, indicated no interest in further inquiry, on the unfounded assumption that early Native Americans would have left nothing significant in this unglaciated and topographically rugged area (a bit too far from Columbus, perhaps?). This author has been proceeding largely on his own with occasional assistance and advice from professional archaeologists, anthropologists, and physical scientists including geologists and petrologists with the training and experience required to determine whether or not a given rock could have acquired its current form entirely through natural processes. Click center image for details. Please click on the image to see it full size (scroll as needed). Judging from ceramic material and a long, straight, and symmetrical earthwork oriented to true north-south, it appears that the upper artifact layer at this site may date from the Early and/or Middle Woodland Period. 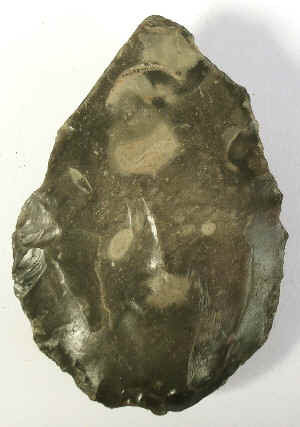 Temporally/culturally diagnostic flint projectile points from the vicinity of the site indicate a human presence dating from the Early Archaic through the Middle Woodland Period, or roughly 10,000 - 1500 years BP. 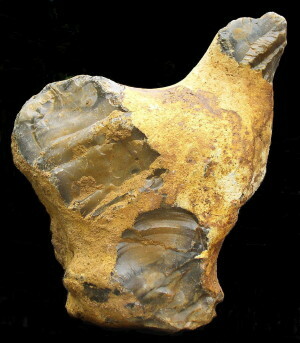 In the nineteenth century Jacques Boucher de Crèvecœur de Perthes, an amateur archaeologist in France, conclusively demonstrated with the aid of professional geologists (to the dismay and anger of the archaeological establishment) that stone tools in that part of the world dated from the Ice Age, a now universally accepted fact in the archaeological community. 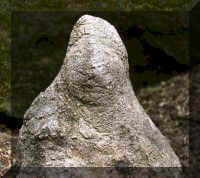 Subsequent to this author's recognition of the iconographic artifacts at this Ohio site, he became aware that Boucher de Perthes had also noted that many of the French artifacts in direct context with the tools incorporated simple anthropomorphic and zoomorphic imagery, calling these "Pierres Figures", or "Figure Stones". This latter observation has since been almost completely ignored, and it remains pretty much de rigueur among modern archaeologists to summarily dismiss the many discoveries of these by amateur archaeologists and casual collectors despite their obvious imagery and physical evidence of human workmanship. The advent of the internet has recently allowed a worldwide exchange of images and data that clearly validate the presence of such artifact material and the consistency of its essential iconographic components and subcomponents. This author has adopted and applied Boucher de Perthes' term "Figure Stones" in presenting his own and others' finds for several years now, and, along with "portable rock art", this seems to have become more or less the standard designation among those now pursuing this line of inquiry. Click image for published article with more photos. 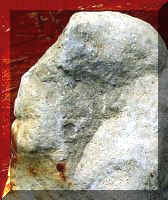 A large sandstone turtle head with eyes on both sides, found by Dirk Morgan near Fort Ancient in Warren County, Ohio, and, after dismissal as a geofact by Ohio's state ("Ohio History Connection") archaeologists, professionally identified as human-carved. Another rejected but professionally authenticated zoomorphic artifact, a bifacially edged side scraper skillfully crafted as a bird figure. Click image for an article on this piece published in Ohio Archaeologist, fall 2013. The age of most of the artifacts at this site has not yet been conclusively determined, but their quantity, consistency of form, distinctive carving marks, and representation of bird and shaman-like hybrid bird-human images indicate that they are of human manufacture. Several spirally fractured deer bones have been unearthed, indicating human activity. Human remains in the form of hair, usually dark brown when not faded, have appeared in direct context with the lithic artifacts. Some of the hairs were submitted to the Center for the Study of the First Americans, where in November 2003 the late Dr. Robson Bonnichsen identified them as human. Genetics researcher Dr. Tom Gilbert attempted mitochondrial DNA analysis of other hairs from the site, but unfortunately none of their DNA had survived, despite their outward appearance of being in good condition. It is hoped that hairs might appear that have been adequately protected from moisture, and freezing and thawing. One of the hairs remaining after the necessarily destructive attempt at DNA extraction has been verified by Dr. Scott Moody, professor of forensic biology at Ohio University, as being obviously human and apparently quite old. Dr. Moody has also identified dyed plant fibers in context with the artifact material. Bird-Human Figures - Click Photo for Explanation. From the huge quantity of lithic artifact material, it seems that this site, with its commanding view, ample water supply, and terraced eastern (sheltered) slope, may have seen more than just part-time habitation. 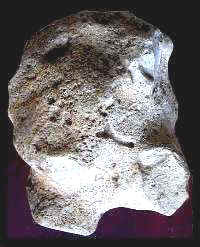 Initially, the possibility of a "pre-Clovis" presence came to mind since while none of the popularly recog- nized "Indian" spear heads and projectile points had appeared, many of the human-modified stones of local and non-local lithology were professionally recognized as in fact being artifactual, with others having a very high proba- bility of being so. But subsequently, similar artifact material has appeared at other sites in direct context with points, blades, etc. temporally diagnostic of time periods as recent as Middle Woodland (roughly 100 BC to 500 AD). Nonetheless, the distinct similarity of the artifact material here to that at the Gault (Clovis) and Topper (pre-Clovis) sites leaves open the at least hypo- thetical possibility that the more deeply buried artifacts (apparently at at least a meter or so beneath the terrain surface) might predate the Clovis time frame. If not temporally "pre-Clovis", they certainly are technologically, and may represent the lithic tools from which Clovis and later technology evolved. And tools of this kind seem to have coexisted for a long time with the currently more recognized and familiar flint implements, serving when and where these were not readily available. 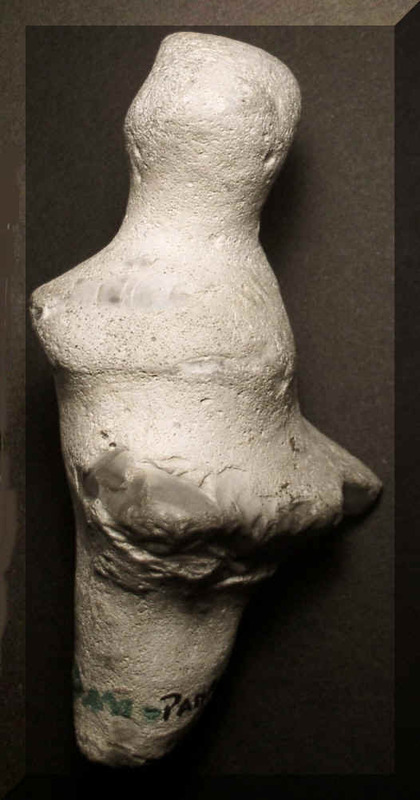 At this point, the actual age of this officially unrecognized yet professionally verified artifact material is of less interest than the simple fact that it is present, but contextual evidence strongly indicates that in the upper strata it is Early to Middle Woodland in age, or very roughly two thousand years old. 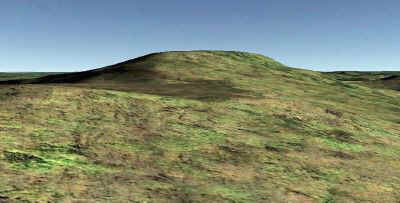 A large linear earthwork is present at the site, a symmetrical rounded wall roughly 6 m (20') high at its highest point and several hundred meters in length. It is quite straight and oriented to true north-south. Such astronomical orien- tation is characteristic of Late Archaic through Middle Woodland earthworks, as is the overall morphology of this structure, which includes a shallow trench along its east side (uphill toward the top of the knob, which affords a long view to the horizon in all directions). Lithic artifact material bearing the carved imagery characteristic of this site has been found in parts of Ohio that, unlike this location, were flattened by glaci- ation, suggesting that the material in those areas is less than 14,000 years old (unless, of course, it simply survived where it was earlier, or was carried in by a glacier). Dave Gillilan in Pickaway County, Ohio (glacial boundary) recently discovered, at a depth of about 1.5 m (5') in apparently undisturbed terrain, a deliberately buried cache of artifacts quite similar in form and composition to those at Day's Knob, but generally more refined, and accompanied by flint and quartz points, blades, etc. characteristic of the Late Archaic and Early Wood- land Periods (roughly 2000 years BP). And some of the other artifacts in direct context are very strange, including non-utilitarian objects of iron, the carbon content of which has been radiocarbon dated to roughly 400 AD, strongly suggesting prehistoric iron smelting by Native Americans. (Similar iron artifacts, not yet dated, have appeared here at 33GU218). Click image for details and more photos. The lithic artifacts found so far at Day's Knob are carved, chipped, split, and/or abraded mainly from the local limestone, sandstone, hematite, and soft yellow ochre. Heavy V-profile incision and carving marks (probably decorative or symbolic in most cases) are a distinctive characteristic of this assemblage. A few of the simple tools are made from non-local igneous (sometimes volcanic) or metamorphic rock. The site is well south of the glacial boundary, beyond the extent of significant glacial outwash; also, it is on a hill rising about 120 meters (400') above any creek beds in which such material might appear. It seems reasonable to assume that this material was imported by the site's inhabitants. Why there are not more flint implements is somewhat of a mystery, but it is evident that the hard limestone abundant at the site was adequate for the population's needs at the time (it is quite capable of cutting wood, for example); they just used what was there, and flint does not occur naturally in Guernsey County. Apparently they were unaware that 21st century AD lithics experts had not approved their material for tool making. 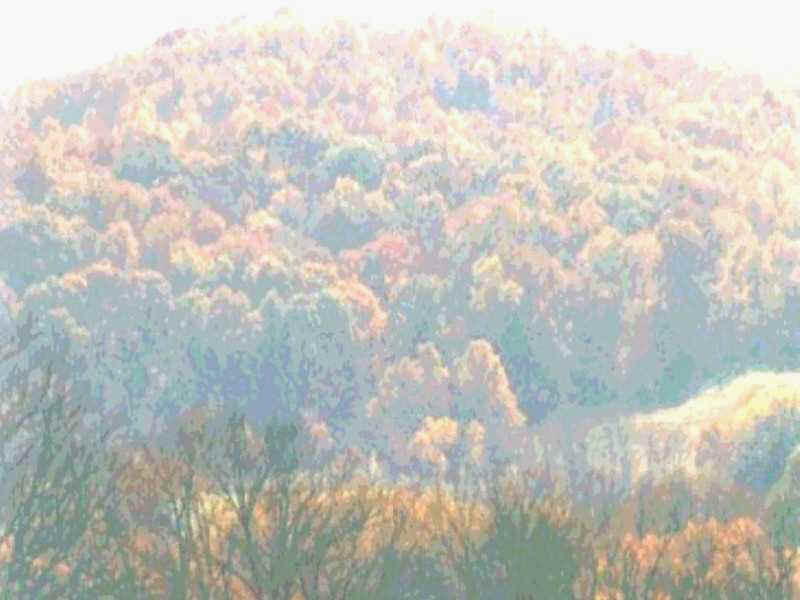 The original expectation was to deal here only with the artifacts appearing at Day's Knob, but it has subsequently (and not surprisingly) become clear that material of very similar form and incorporated iconography is to be found in many places in North America (as far away as California), and, rather unexpec- tedly, in other parts of the world. Among professionally excavated potentially "pre-Clovis" sites in North America, it almost certainly is present (even if not recognized) at Topper beneath the Clovis-age strata, and at Gault among diagnostically Clovis-age material. Strangely enough, in many cases the functional tools at 33GU218 are formed at least abstractly in the shape of birds or bird-humans, which appar- ently played a dominant role in the belief system (animism/shamanism?) of the people that left these mysterious objects behind. Most of the bird forms have a rounded or even anthropomorphic face, but the overall morphology, and an eye distinctly carved in the appropriate place, are unmistakable when one even casually looks for them. Bird-Shaped tools - click image for details. Tools and/or decorative/symbolic objects ("portable art") of this form have also appeared in other parts of the world; some of these are claimed to date from several hundred thousand years ago, and the easily recognized form persists in tools well into the Neolithic. Besides being fashioned from rock, some of the primarily symbolic or decor- ative bird figures at Day's Knob are fashioned from various organic materials. The organic materials' state of preservation is good, apparently due to their having been packed tightly into clay of low acidity. This includes the verified human hairs that have appeared in direct context. Even more frequently than the actual bird form, the image of a hybrid bird-human creature appears - referred to here as the "Bird Spirit". (Since this author seems to have discovered it, at least in this context, he presumably can call it whatever he likes.) Whatever the age of this site might prove to be, the Bird Spirit image in itself is probably of considerable anthropological signifi- cance, being apparently of quite ancient origin. 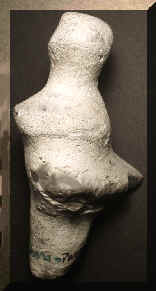 In artifacts of the European Paleolithic it appears consistently, resembling in small detail the image here, and persists quite identifiably into modern but traditional Inuit/Yupik ("Eskimo") "transformation art". 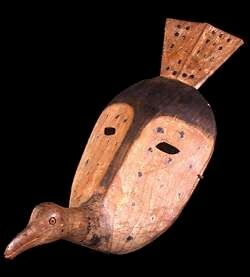 (Actually, it has subsequently come to this author's attention that the Inuit and Yupik have been calling this bird-human figure "Bird Spirit", or even just "bird", for a very long time. Oops! So much for this author's originality...) The figure also appears in Australia, Asia, and other parts of the world, seemingly a Primal Image. A bird or other creature facing forward (sometimes sideward) on top of the head, often suggesting shaman headgear. One or more creatures emerging from the mouth, possibly a theme of regeneration or transformation, like the figure-emerging-egg-like and figure-from-the-belly imagery also shown below. Sometimes there is a fractal-like succession of figures, each emerging from the one preceding it. The head of a creature emerging from the belly of the primary figure. A creature emerging from the posterior, in the manner of an egg. Janiform - a face at one end of the figure, another at the the opposite end looking in the opposite direction. Typically one face is more or less anthropomorphic, and the other more zoomorphic. 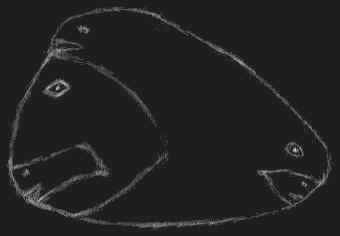 A mouth consisting of two birds conjoined most of the way back from their heads, and facing away from each other with their heads forming or occupying the corners of the mouth. When the figure is depicted only in profile (more common), the mouth has the form of a bird facing toward the back of the head. This gives an appearance that easily causes the image to be misidentified as an animal such as a bear or wildcat. Sometimes the mouth takes the form of a big toothy grin. Eyes typically circular or diamond-shaped, very often with a distinct raised or indented iris in the center. When the face appears in frontal view, often one eye is open while the other (more commonly the left? ), is partly or fully closed. The eyes seem to have received particular attention to detail, and are among the most quickly recognizable evidence of human agency in the lithic artifact material. Sometimes they are micro-carved into the form of a bird or bird-human head. A nose consisting of a bird or human-like head facing outward or downward. A chin, if significantly present, in the form of another creature. A bird or bird-human riding on the back of another one, often suggesting copulation. 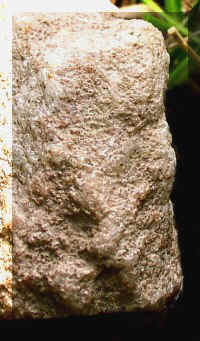 A bird or other creature on the side of the primary figure. The figures typically exhibit symmetry in that the reverse side usually bears a similar image, at least thematically. As is obvious from the features described above, the figures are typically polymorphic/polyiconic - multiple images in one. The details of an image and its multiple components are often not deeply or distinctly carved, and are usually best visible (sometimes only visible) with the light source above the figure when positioned vertically. Often, when the figure is rotated 180 degrees, one image or set of images virtually disappears, and another comes into view. The artisans clearly understood the interplay of light and shadow. Likewise, rotating 90 degrees quite often has the same effect, or sometimes turning to an intermediate angle, depending on the geometry of the rock. While often varying markedly in overall appearance, the figures appearing almost always exhibit the same general arrangement of subcomponents. It is interesting to speculate on the origin of the Bird Spirit image. Cave paintings of the Paleolithic, with their magnificent depictions of animals of all sorts, often include people only as simple "stick" figures, if at all. It has been conjectured that humans of that time considered themselves to be essentially separate from the natural world, having come from above. One of this author's possibly strange hypotheses is that this Bird Spirit figure is the manifestation of a sort of "collective unconscious". Many or perhaps most of us have had vivid flying dreams, particularly in childhood. It seems reasonable to think that if we do it, people hundreds of thousands of years ago did it also, and took it much more seriously and literally. And early humans poking around on the ground must have regarded birds with more than a little wonder. When people first began to think of themselves as transcending their earthbound condition, birds must have quickly come to mind, and a "morphing" of human and bird in their physically rendered imagery seems a logical extension of this. Given its wide geographical distribution and apparently great antiquity, one might tentatively speculate that the bird-human image originated in Africa, then was carried into Europe and the Middle East, then on into Asia and Australia, and across Beringia to North America. Figures that can be identified as distinctly human are less common at this site than those that are zoomorphic or zoo-anthropomorphic. Of the human images that have appeared, several are faces eye-to-eye or mouth-to-mouth with a hybrid creature, sometimes sharing an eye. These are usually explicitly or abstractly a bird or bird-human image, but may contain these images within a larger figure that looks like another animal. These are two pendants - one the image of a bird, the other a disk. The holes drilled in each are of the same size, and appear to have been produced in the same manner. Many symbolic or decorative images are as small as a couple of millimeters, indicating remarkable visual acuity. One of the more unusual (and certainly controversial) finds at this site is the many zoomorphic figures made from clay or a compressed amalgam of mud, ochre, and plant material. Some contain verified human hairs and/or artificially colored plant fibers. Leaves and other plant material were sometimes attached, including a piece of pine cone in one case. (There are no pine trees currently at the site.) Apparently, packing the objects into the dense clay created a more or less anoxic environment that protected the plant material. Wooden bird figures, as well as cleanly cut and carved wooden sticks, often appear buried in the clay, rather well preserved in context with other artifact material. Since there is evidence at this site of extensive earth moving and at least some plant cultivation, it seems likely that many of the tools were simply digging implements. Small Gouges and Picks: These are pointed implements contoured for right-handed thumb and finger grasp, often in the form of a bird or bird head. Large Gouges: These are pointed or chisel-shaped right-hand implements contoured either for downward or for forward thrusting. 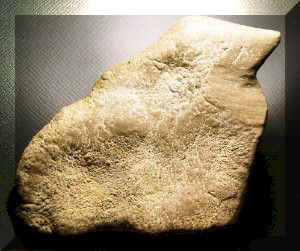 Like the hand axes, they often exhibit the characteristic grooves and ridges for thumb and fingers. Hand Axes: These have a bifacial bit edge and a wider, rounded proximal edge for right-handed grasping. The sides of the implement are often grooved and/or ridged for thumb on one side and fingers on the other. Wing-Shaped Implements: These are flared trianguloids in a generally birdlike form, including scrapers, hand axes, gouges, and abraders. This is one of the most common templates in the assemblage, and maybe a precursor of the well known bannerstone. Misc. Scrapers and Cutting Tools: These vary considerably in size and form. Most are more or less in the shape of a bird or bird head. Semilunar Implements: These are celts, scrapers, or abraders with a bifacially beveled bit edge along the circumference, and a flat or more-or-less flat proximal grasping end. They are usually very simple, but are sometimes well detailed with contours and/or flanges for right-handed holding. The size range is considerable. Sandstone Abraders: Hand-held or finger-held grinding tools apparently for surface reduction and forming of other implements and decorative/symbolic objects. These appear in huge quantity across the site. Tool Preforms: Rocks split and carved in preparation for further process- ing into tools. Although the implements are sometimes bizarre in appearance, close inspec- tion reveals genuine skill, creativity, and attention to detail in fabricating a functional tool from the material at hand. It seems reasonable to assume that these tools were, when actually used, applied with considerable force over an extended period of time, and that sharp or rough edges against the hand or fingers would have been intolerable. On this assumption, an object at this site is very seldom classified as a tool unless it meets these simple criteria: It must fit firmly and comfortably in the right hand, or, if small, in the fingers of the right hand. When the object is held in a position in which there is such a fit, the bit edge or point must be in the appropriate orientation to perform its func- tion. It is remarkable that, with the exception of some of the more amorphous sandstone abraders, the tools present at this site both meet these require- ments and manage in most cases to recognizably if abstractly incorporate the ever-present bird or Bird-Human image. It seems that cutting the image was an integral part of the manufacturing process, as much so as making the point or edge and the grasping surface. It was seldom an intentional display of artistic virtuosity - just part of the routine, perhaps like forming the cross on hot cross buns. Assuming an animistic belief system, maybe it was just putting the spirit's image on the rock it was believed to inhabit. 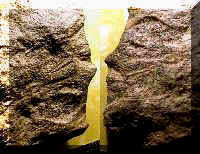 In any event, it seems that a rock was modified to incorporate both utility and symbology. 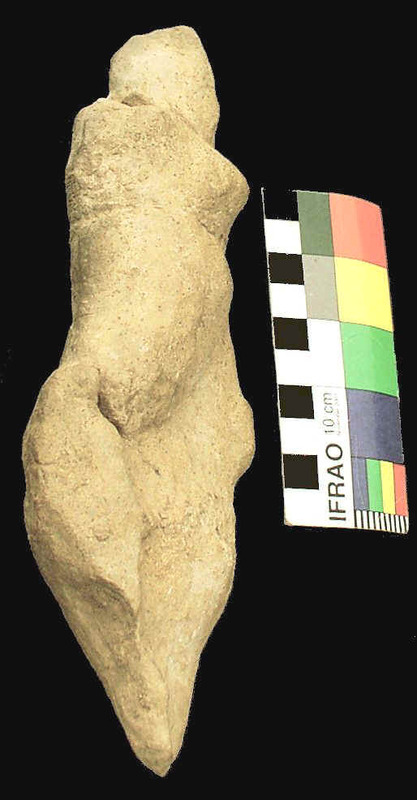 It is interesting and significant that just recently professional European archae- ologists have announced with great fanfare their realization that simple tools at Wilczyce and Lalinde/Gönnersdorf, showing no signs of use wear, are in the form of the long recognized "Venus" figurines that have appeared at various sites. The fact of the matter is that amateur archaeologists, free of the long- standing preconceptions, have been recognizing and publishing this relation- ship for decades. While the perceptiveness and insight of the professional archaeologists in this recent discovery certainly is to be commended, it seems that this announcement is, as is so often the case, a matter of assigning impor- tance to a given discovery less on the basis of its archaeological significance than on the academic credentials of the observers. 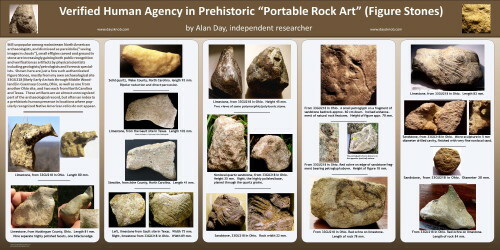 The presence of rudimen- tary "portable rock art" in the form of "tools" has long been rejected in Europe and elsewhere, this being "argumentation from absence"; no one (with a very few unpopular exceptions) in the professional/academic archaeological com- munity had reported it, so it was assumed not to exist. Along the 130m (425') access path from the ridge road to the top of the hill, after years of erosion and maintenance grading, from roughly 25 cm (10") to 60 cm (24") below the current terrain surface. In a large hole dug out by deer around a salt block at the top of the hill. In several small test holes at random locations. On and near the surface of the large earthwork along the west side of the hill. On and below the surface of a large artificially terraced area including the spring on the steep east (sheltered) side of the hill. On or near the surface, or eroding from banks in quarried or otherwise disturbed areas of the site. Characteristic artifact material has, in some cases, been retrieved from far below the current terrain surface. Most of the artifacts collected at this site have been cataloged or at least sorted by the location of their appearance, but a controlled dig remains to be com- pleted. One 1x1 m square was started in 2003, with lithic objects logged by XYZ coordinates. This was left on hold, mainly because of the large quan- tity of artifacts that suddenly appeared as the result of heavy rains eroding the deeply rutted "driveway" up the hill, requiring full-time attention. 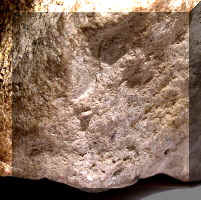 Although barely started, this square has produced numerous clearly fabricated sand- stone objects, most of them bearing the ubiquitous bird/human image. Day's Knob would have been highly favorable for habitation, with its commanding view in all directions, ample water supply, and abundant lithic material, and it clearly was the site of much human activity. However, it is hardly unique. There are undoubtedly many other such sites in North America waiting to be discovered by professional or amateur archaeologists willing and able to see beyond the current and rather rigidly orthodox paradigm for aboriginal American artifacts. (Topper in South Carolina is almost certainly such a site.) 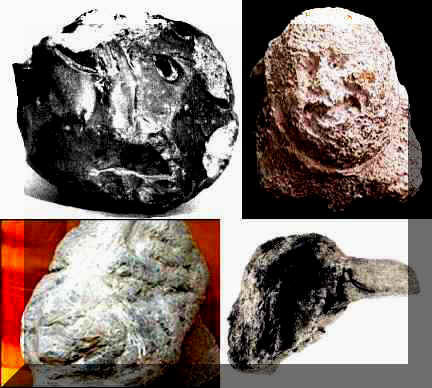 Many photos of similar artifact material, resembling that here in minute detail, have been e-mailed to this author. If one were given to wild speculation, one might present the heretical hypothesis that North America was well populated before the advent of the diagnostically "Clovis" implements. One way or another, it is seems likely that the ground of North America will yield quite a large body of heretofore unrecognized artifact material related to but morphologically distinct from that popularly seen as Native American. 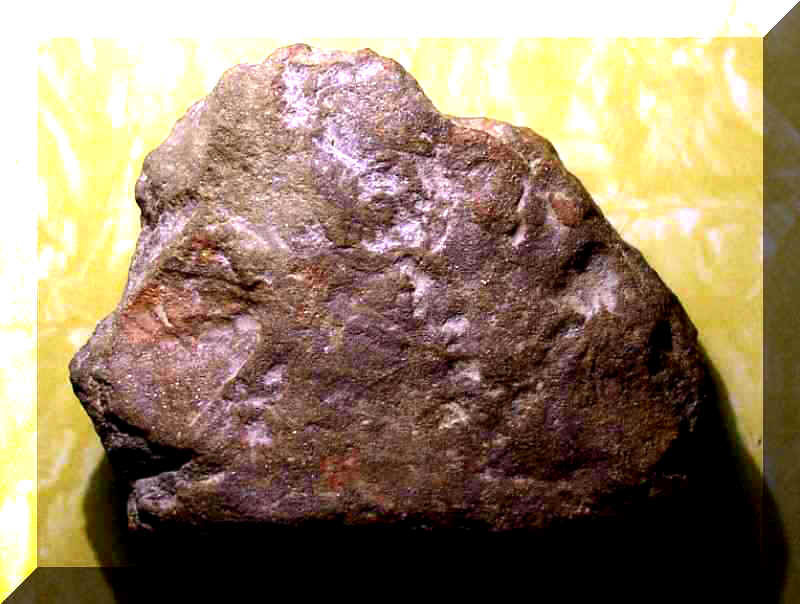 Simple "figure stones" have, since their first discovery by the archaeological pioneer Boucher de Perthes in the nineteenth century, been rejected, ignored, and discarded by archaeologists despite verified evidence of human agency. This is a sad and almost inexcusable oversight given that figure stones present an index to a site's early human presence where more popularly recognized artifact material is not present. In short, there is a lot more to all this than just "arrowheads". Note to persons recognizing and collecting artifacts like those shown here (or any other artifacts, for that matter! ): Please record the exact location of each find (a handheld GPS unit can be quite helpful in this). Place the find in a plastic "zip-lock" bag along with a note detailing its provenience. Context is very important. If the artifact is damp, let it dry out before resealing the bag. If you think you must clean it, look under magnification (at least 10X) for adhering material of interest. For example, on several occasions at this site human hairs have been found in the encasing soil, even well below the current terrain surface. Thanks! And please note: Being rather overwhelmed, I apologize for falling far behind in replying to and corresponding with the many visitors who have submitted questions and comments. Your input is quite welcome, and I will try to catch up with all this.